I decided to read The Lake of Dead Languages for two reasons: some book blog compared it to The Secret History and I found a gently loved copy of it at the Strand over spring break. I had a feeling I would like this so I decided to save it as a reward for getting through something more difficult. Annnnd I read the whole thing on an eight-hour bus trip. The Lake of Dead Languages is the kind of book you fly through. We’ve talked a lot in Geronimo’s class about ‘the secrecy plot’ – i.e., a story that all leads up to the revelation of some (usually dark and devastating) secret. And, in critiquing a lot of people’s first few chapters, we’ve discovered that it’s a lot harder to do than it might sound. How much information do you share? How much do you withhold? Can the main character keep secrets from the reader? Etc. Well, I don’t know what the perfect formula is, but Carol Goodman’s figured it out. The Lake of Dead Languages flows like the Nile – smoothly and swiftly, and sometimes in totally unexpected directions. When everything finally starts to fit together, it just feels good. Not many novels achieve that. 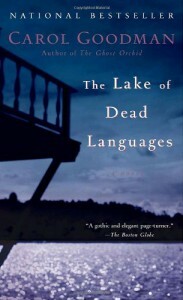 The Lake of Dead Languages tells the story of Heart Lake, a boarding school for girls with a deeply troubled history. In narrator Jane Hudson’s senior year, one of her roommates committed suicide and shortly afterward, her other roommate and that roommate’s brother drowned in the lake. When Jane returns to the school years later to teach Latin, her past starts to catch up with her, and things go horribly wrong. I won’t give away anything else, because is the kind of story you want to read for yourself. There are so many good things: Goodman’s sense of place is so detailed and so specific that you can almost follow the path from the school to the lake to the icehouse without help from Jane or the other girls. Her characters are deeply troubled mysterious creatures, but never implausible. This is a profoundly intelligent, emotional book, a volatile story told with impeccable control. But of course, it’s not perfect. We see all too clearly Jane’s unhealthy obsession with Matt and Lucy Toller, but we never get to know them as well as we’d like. Deirdre is much the same. We see all of the other character’s through Jane’ eyes, but in many instances her vision is limited. I said before that the story flows like a river – and so it does. 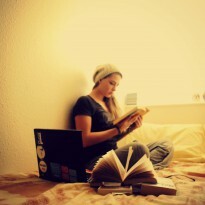 It’s effortless to read. One sentence leads you seamlessly into the next. For the most part, it’s a lovely effect. But there aren’t any sentences which are lyrically arresting (and I think as a writer that Goodman is certainly capable of that, she just needs to take a few more risks). Find is on Goodreads here.